Happy Sunday. Peaches here! As you will notice from our header I am no stranger to hats. In my opinion, a soft hat caresses the ears...I am always up for THAT! Here I'm wearing a scrumptious blue crocheted hat that Ellen Pilch's (of 15 and Meowing) famous grammie made a couple years ago. Let me tell you it is a favorite in this household. 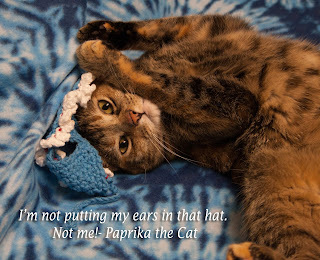 Paprika lying ON the hat, not wearing it! A favorite for ME! Paprika will have nothing to do with hats, she is on the wrong track but what can I do? She will lie down ON it but won't put it on. Oh well, I enjoy it enough for both of us. I made sure in my picture that my pink toe pads show, as the blue and pink are a great combo! Disclosure: we did post this last year but it's the only comfortable hat I have! My human is into "virtual hats" but I insisted! Hope you don't mind. We are joining Cat on My Head's Sunday blog hop today. Stop to HOP! Ya look pawsome in dat hat! 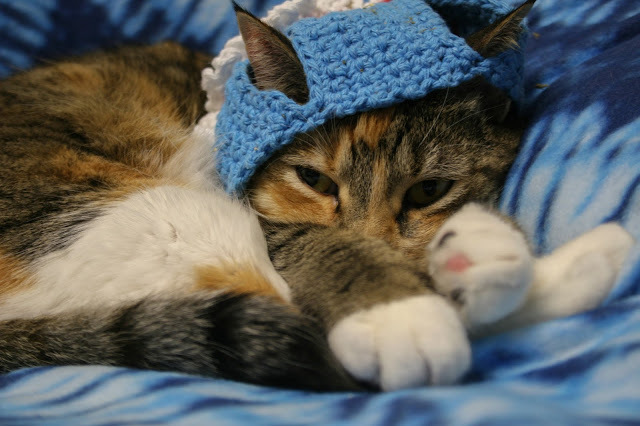 Oh I think that is a VERY cute hat - I just bet it feels wonderful in the cold weather keeping your head cozy! You look very sweet in your hat. Those are someeautifl selfies. I do like the hat on you. You look cute in your hat, Peaches. As for us, we only like virtual hats. You look SO cute in that hat!!! Peaches, that hat is just purrfect on you! This is such a great hat. I would to try something with this with my cat. The pictures of your cat came out so cute!! thank you! 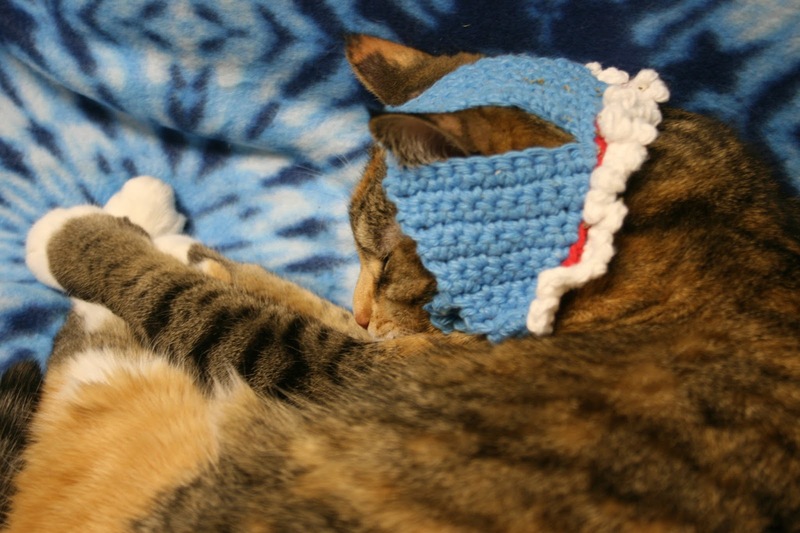 Every cat is different so your cat may like a hat as long as it is soft and caresses her ears. Peaches loves it but my other cat Paprtka is just the opposite. Takes all kinds!